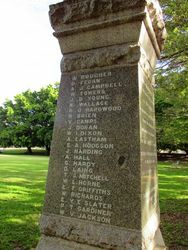 Wickham War Memorial was erected in memory of those from the district who died in service or were killed in action during World War One. 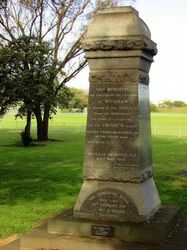 The memorial was re-dedicated in 1973. 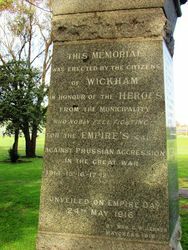 The ceremony of unveiling the Wickham Soldiers' Memorial was performed yesterday by Mrs. G. W. Jenner, Mayoress of Wickham, in the presence of a large assemblage of residents. 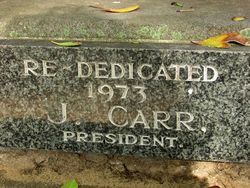 The foundation-stone of the monument was laid on January 26th, and the function yesterday was the unveiling of the granite pedestal containing the names of the fallen soldiers and upon which will stand the life-size bronze statue of a soldier. 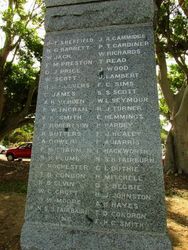 Though the sky was dull and overcast, and there was a sprinkling of rain, several hundreds of people were assembled in front of the council chambers, where the memorial, stood completely hidden in the folds of the Union Jack. 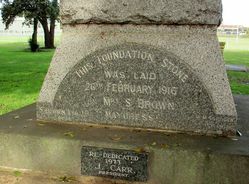 As the folds of the encircling flag fell away there was disclosed a pedestal which, in design, construction, and material, will long stand as a fitting and beautiful memorial. 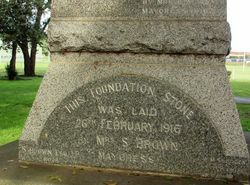 The pedestal is a polised block of Harcourt granite, with rock faced margins top and bottom. It is surmounted by a handsome cap and canopy, upon which will rest a bronze statue of a soldier, the gift of Mr. Alfred Goninan. 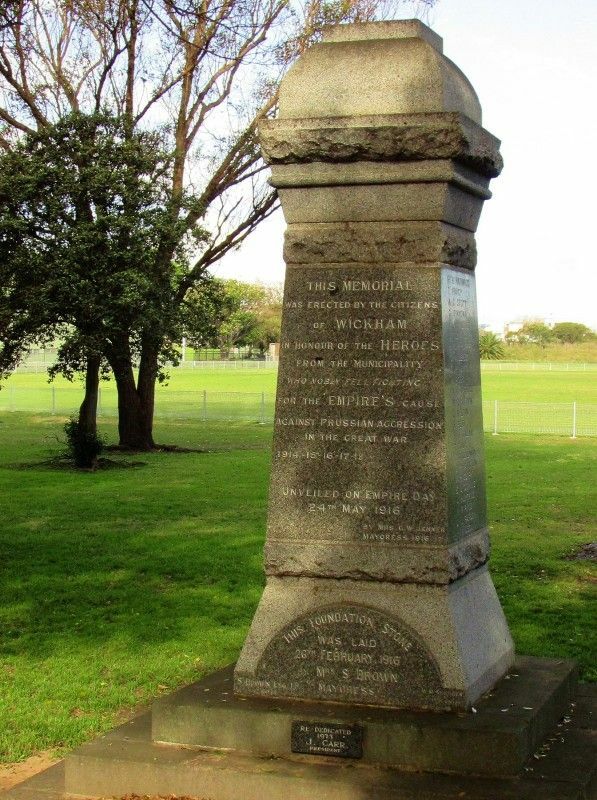 The monument as it stands was designed by Mr. D. Meldrum, of Messrs. Meldrum and Markey, monumental masons, and the firm were the successful tenderers and suppliers of the monument, which is wholly of Australian construction. 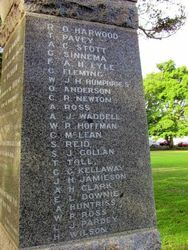 On the eastern side of the memorial are cut and in letters of gold the names of the following men who have fallen to date:-W. Boucher, D. Fegan, A. J. Campbell, W. Towers, J. D. Young, N. Wallace, R. O. Harwood.